The Short-eared Owl builds its nest on the ground. The mice-population determines the success of the Short-eared Owl. 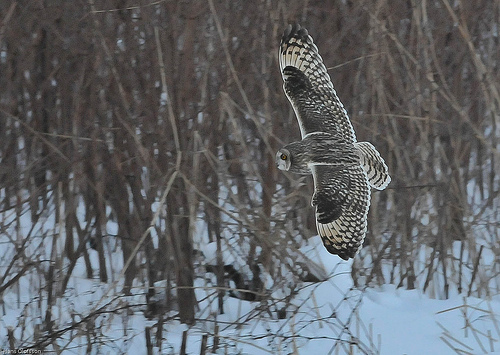 When it is a bad year for mice, it is also a bad year for the Short-eared Owl. 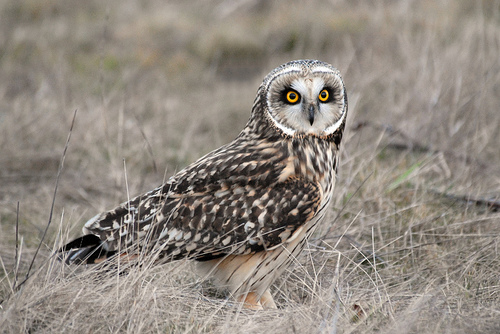 The Short-eared Owl has a light coloured belly and rather coarse black stripes on the tail. It doesn't have ear tufts like the Long-eared Owl. The Short-eared Owl is smaller and more slender than the Tawny Owl. The Tawny Owl has broad wings.